Did you know that batteries are recyclable? They are but research has showed that despite this nearly 8000 tonnes of batteries still head to landfill every single year. 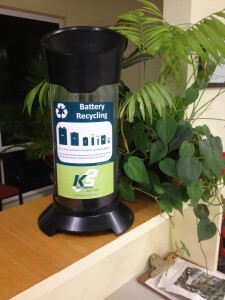 To combat this unnecessary landfill KS Environmental have created a Battery Recycling Program that takes single use and rechargeable batteries and recycles them for the metal components they contain. 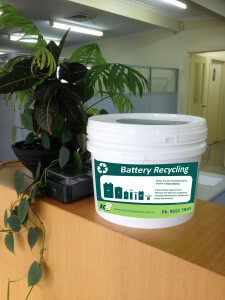 KS Environmental can provide your business with 5 litre or 11 litre prepaid battery recycling buckets as well as offering a recycling service for any bulk mixed batteries. We can also supply you with battery recycling tubes that are ideal for front of house (and can then be decanted into the prepaid buckets as necessary.) It really couldn’t be easier. So keep the old batteries from your calculators, torches, radios, mobile phones, laptops, cordless tools and cameras and let us take care of the recycling. Please Note: bulk mixed battery recycling excludes Lithium Primary, Lithium Manganese, Lithium Sulphur, Lithium Thion, and Mercury Batteries.